Where To Start With Spelling? 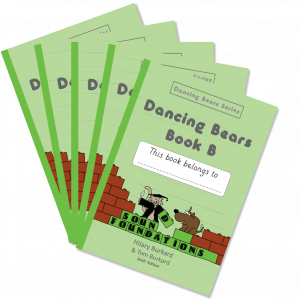 Dancing Bears Book B contains similar exercises to Dancing Bears Book A. Words with suffixes—ing, ly, ed, er, en—are taught, preparing pupils for the morphemic approach to decoding multi-syllable words that has made our Word Builder exercises such a tremendous success. Split digraph (magic 'e') words are introduced in this book. Dyslexic pupils often have a lot of trouble with silent 'e', so this gets a lot of practice and review. Soft 'c' and soft 'g' at the ends of words (nice, page) are taught and other new patterns include less-common digraphs and trigraphs (ur, aw, tch, dge), and three-letter consonant blends (str, spl). Ambiguous digraphs (ea, oo) are introduced along with a large range of irregular spelling patterns in the cloze sentences. With our unique Word Builders, pupils lose their fear of long words and reading them in context of helps to teach the meanings. The serial story continues with longer episodes in this book. Look inside Dancing Bears Book B. This book provides a structure for children who struggle to develop phonics for reading. It is a good follow on to Book A as it both recaps the sounds from Book A and moves on progressively to new phonemes. It also helps children to build up knowledge of tricky words that can’t be decoded. It begins to support children to focus on word endings such as ‘ing’, ‘ed’, ly, etc. There is a lot of work devoted to split digraph words (magic e). It is repetitive in style; but for children who struggle this does not seem to matter in most cases. Five copies of Dancing Bears B for the price of four. 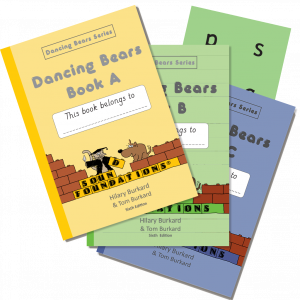 I just wanted to say firstly that your books are fantastic, my son who I am convinced is dyslexic, has been struggling for 2 years at school with sounds and words and we have only been doing Dancing Bears for 2 weeks and he is catching on really well! Just thought you would like to hear some happy news! One of our pupils, who was struggling with his phonics has worked his way through Apples and Pears A, B, C and is now going on to D. He is flying! We are all very thrilled with his exceptional progress. Well done to you! I think it is a great programme you get RESULTS.